Arthur Lee Luna, age 88, of Nashville, TN passed away on Friday, December 21, 2018 at his home. He was born in Smithville, TN on September 25, 1930 to the late Elzie Luna and Pearlie Mae Luna. Along with his parents, Arthur is preceded in death by one brother, James Luna and one sister, Mable McGill. He is survived by his loving wife of 66 years, Patricia Ann Hand Luna; children, Paul Luna(Tricia), Timothy Luna(Stacey), Walter Luna(Tammy), Robbin Elizer(Jeff), and Lori Morgan(Bobby); 6 grandchildren; 4 step-grandchildren; and 7 great-grandchildren. Arthur is also survived by his siblings, Edward Luna, Elnora Hall, and Toy Luna. 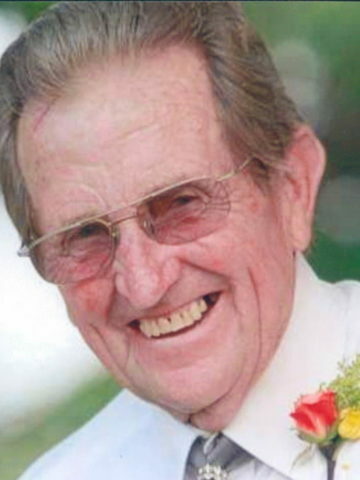 Arthur was a long-time car salesman with McPherson Motors. In his pastime he enjoyed hunting, boating, and fishing, which explains why some of his fondest memories are his days growing up on Pond Creek. A celebration of life will be held on Thursday, December 27, 2018 at 1:00pm in the chapel of West Harpeth Funeral Home. Visitation will be held on Wednesday, December 26, from 10:00am until 8:00pm and again on Thursday from 10:00am until the time of service. Arthur will be laid to rest at Forest Lawn Memorial Gardens. Tim our thoughts and prayers are with you and Stacy . May God bless you and your family. What a great homecoming awaits us all. A lot of people called him Arthur, some people knew him affectionately as Ott, but the people who knew, respected and loved him called him PAPPY. Heaven is a little brighter now that he got his ultimate healing. Rest easy Pappy, we will see you again. My thoughts and prayers are with you all. I was an adult before I knew his name was not Ott and was really Arthur Lee. As a second cousin growing up Ott was all I ever knew him by. My thoughts and prayers are with you all. My heart hurts for my sweet sweet Patsy. What a joyous time is being had in heaven as he reunited with his lord and savior and so many of the family who have gone before. My Thoughts And Prayers Are with The Family now and days to come. I remember Mr Luna (Ott) from when I was a little girl. I lived right behind Granny Hand on Elaine Ave.. I knew the Luna family from growing up with them and going to school with them. Mr. and Mrs. Luna took me to Cracker Barrel for the first time when I spent the night with Robin when we were growing up. I will always remember that, it meant so much to me to go with them. The Luna and Hand families are very special people. I am so sorry for your loss. Mr. Luna was a great man. Randy and I are so sorry for your loss. We will keep the Patsy and the family in prayer. I am so sorry for. Your loss. Great memories of growing up in the neighborhood, God bless all of you!!! Aunt Patsy, so sorry for your loss. He was Uncle Ott to me. I remember staying at you guys house a lot when I was a teenager. Not that I’m proud of it, but when I didn’t want to go to school, I would hide out at your house. Didn’t like High School much because I wasn’t allowed to participate in many activities. Daddy was really strict. Your house was my 2nd home. Uncle Ott was always smiling and joking around. He will be missed very much. My prayers are with you, Aunt Patsy, Paul, Timmy, Walter, Robin and Lori and your families. Love you all. A good man and one who walked with God. Glory Bound Brother Ott……. Vicky Diane Tuttle and family. New him as Ott when I was growing up. My ♥ goes out to Patsy and the kids. I 😍 Ya’ll and you will be in my prayers. Will be coming to pay my respects. My dad was Clifford Turnbo, and he and my mom (Virginia) thought the world of him . When I was a small child growing up in West Nashville. , Mr Luna was “Ott” or “Autha Lee”. Condolences to all the family. So sorry for your loss. I just seen it today or I would have came to visitation. Our prayers are with the all.